The painter Bibesco (Francesko Maria Masmata) died in Genoa (Italy) on 31 August 2018. He was born in Genoa on 22 July 1941. 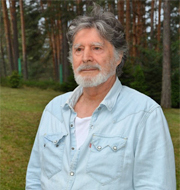 He began doing painting in 1995. He had solo and group exhibitions in his country and abroad. 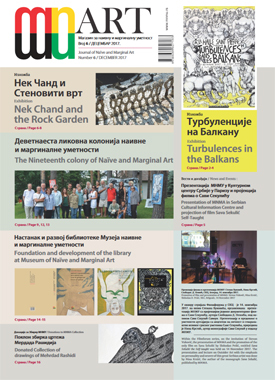 He participated in the Nineteenth Colony of Naïve and Marginal Art (2017), organised by MNMA (Jagodina, Serbia). The greatest collection of his works is in Genoa. MNMA has also some of his realisations. Bibesco immersed deposited observations from the surrounding world into the depth of his subconscious creative impulses of his authentic imagination, transforming them into completely new pictorial reality. 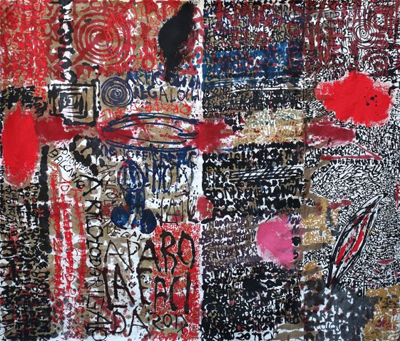 With inventive compression of entangled traces of time, the artist imprinted personal experience of eternal topic of merciless transience in his canvases, thus creating a specific topography of signs and symbols. On 7 September 2017, in overcrowded Halle Saint Pierre, our exhibition of paintings and sculptures of the artists from Serbia entitled Turbulences on the Balkans opened; the exhibition was organised by MNMA (Jagodina Serbia) and Halle Saint Pierre, Paris. 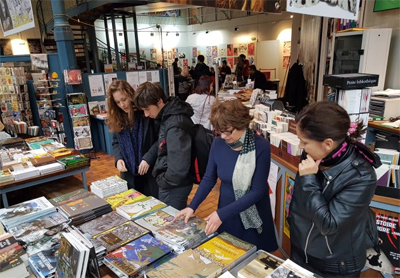 The representative collection of multi-lingual monographs and other advertising material published by MNMA drew special attention of the audience. On Friday, 20th October MNMA organised presentation about works of artists from Turbulences in Halle and promotion of advertising material. As our guests: Marc Bourlier, sculptor from Paris and Nadezda Musyankova (custos, Tretjakov gallery) takes part in presentation of MNMA. 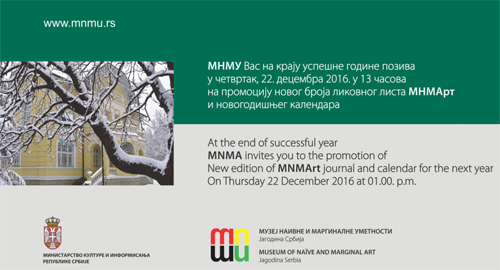 Jagodina, MNMA, Thursday 22 December 2016 at 01.00 p.m.
On Thursday 28 December 2017 at 6.00 p.m.
At the end of very successful year MNMA invites you to the promotion of New edition of MNMAart journal, Collection of articles and calendar fot the next year. She was born in Kolari near Jagodina (Serbia) in 1938. She began doing painting in 1971. As a believer from her early days, she was bought up in patriarchal spirit, always aspiring towards the ideal order of things and virtues. 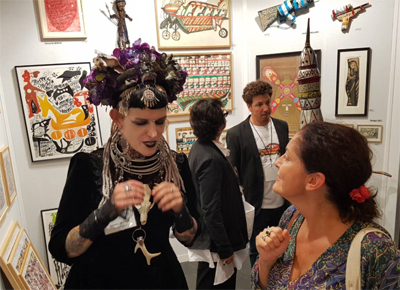 She tirelessly incorporated all her revelations and apocalypses into her unique creations in canvas. Animating her deepest thoughts and dreams, she liberated herself from dark contemplations and pressures which came from the outer world. The world within was her only one. Evasion of forms and colours shows the creativeness of her intellect and intensity of her pictorial expression. She is inspired by folk tales and legends, hence the presence of dragons, emperor’s castles, and phantasmagorical rituals from beyond. Human figures and imaginary hybrid creatures are walking along fictitious gardens of paradise. Her colouring is intensive and raw. Ornamental and decorative treatment of forms, achieved by dots, lines and vaults create a unique rhythm in the canvas. Metamorphosis of shapes and an unusual harmony of floral, anthropomorphic and zoomorphic elements in the paintings point to horror vacui. With her creative fansy, the artist has made authentic parables and tales about the good and the evil. By using the mosaic of coloured, vibrant pigments, she achieves optical effects. Frontal construction of her compositions, surrealist subject matters and authentic chromatic dance are the main characteristics of her expression. Friday, 28 October 2016 at 7.00 p.m. 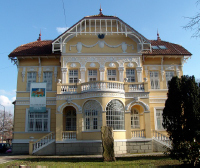 Opening ceremony: 20 October 2016 at 7.00 p.m.
Amidžin konak, Kragujevac, Vuka Karadžića 3. Joškin Šiljan, IS ANYBODY HERE?